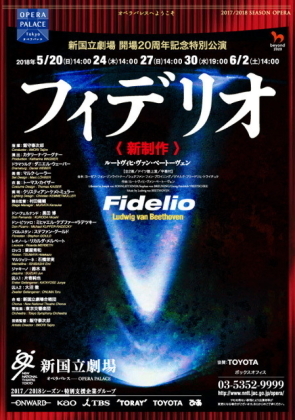 The opera "Fidelio" is the sublimation of BEETHOVEN'sidealistic spirit. With its theme of liberation for the sake of justice, loveand freedom, and its finale evoking overwhelming emotions, "Fidelio"shares with "Aida" the status of a celebratory work staged the worldover for special occasions such as the opening of a new performance venue. 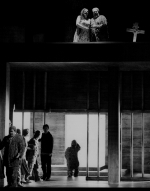 "Fidelio" was staged for the re-opening performance at the rebuiltVienna State Opera after the Second World War in November 1955, the month afterthe end of Allied occupation. IIMORITaijiro, with his profound knowledge of German music, conducts the orchestra.Two of the world's top opera singers, Stephen GOULD and Ricarda MERBETH appearas Florestan and Leonore, and one of the greatest dramatic bass baritones ofhis generation, Michael KUPFER-RADECKY plays the role of Don Pizarro.